GRILL DIRECTIONS: In small bowl, combine oil, wine, rosemary, sage, chives, salt and pepper; mix well. Place chicken breast halves in resealable food storage plastic bag. Pour oil mixture over chicken. Seal bag; turn to coat. Refrigerate at least 2 hours to marinate, turning occasionally. Heat grill. When ready to grill, remove chicken from marinade; reserve marinade. Place chicken on gas grill over medium heat or on charcoal grill 4 to 6 inches from medium coals; cover grill. Cook 10 to 15 minutes or until chicken is fork-tender and juices run clear, turning once and brushing occasionally with reserved marinade. Discard any remaining marinade. To broil chicken, place on broiler pan; broil 4 to 6 inches from heat using times above as a guide, turning once and brushing occasionally with reserved marinade. A marinade can flavor and/or tenderize meat. Since chicken breast is a tender cut of meat, the marinade in this recipe is solely for the purpose of adding flavor. Use a kitchen shears to quickly snip or chop fresh herbs. 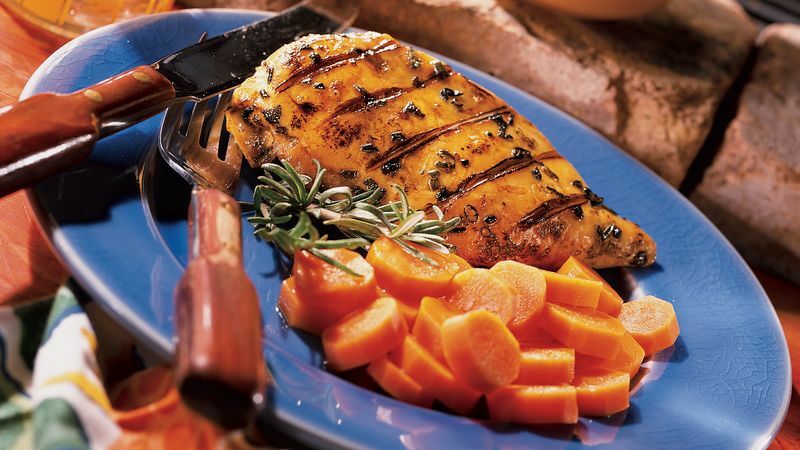 For even cooking place the narrowest or smallest ends of the chicken breast halves to outside edges of the grill where the heat is usually a bit less intense.